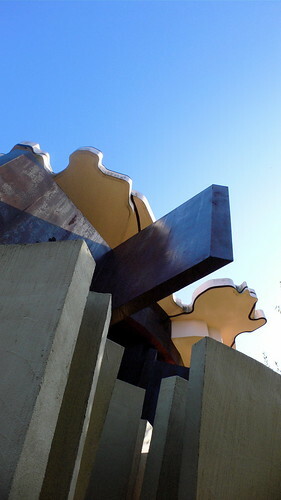 By guiding visitors through various unexpected experiences as they walk through its component areas, the Site offers them opportunities to rethink their physical and spiritual orientation to the world. 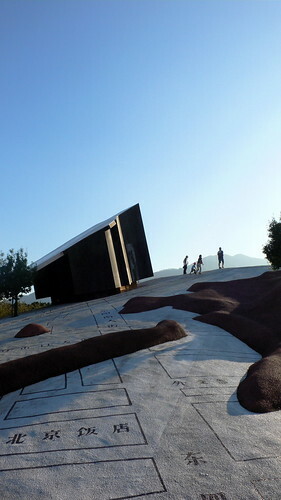 Opened in October 1995, the Site of Reversible Destiny is an ‘experience’ park conceived and designed by the artist Arakawa Shusaku and his wife and artistic partner, Madeline Gins. 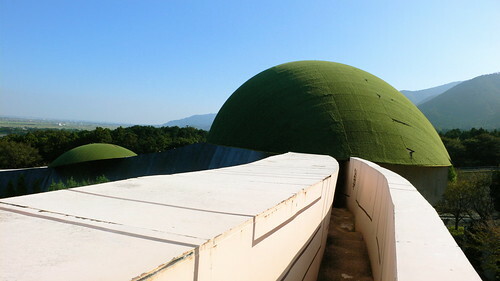 Cradled between the mountains of Yoro in Gifu Prefecture, the site resembles a dislocated patch of alien terrain, or perhaps even the set of a 1970s sci-fi movie. I couldn’t agree with that last bit more — walking around in the central bowl of the Elliptical Field is as close as you’ll ever get to wandering around the inside of a lost Logan’s Run episode. The Site also reminded me of the utopian experimentalism of the ‘organic’ and visionary architectures of the 1970s — Roger Dean’s work comes to mind — in the sense that the Site requires your body to move outside of its normative modes of encounter with architectural space. The way in which the Site destabilizes the body’s relation to the space that it travels through provokes a kind of freedom of constraints via the very unexpectedness of the situations you are led into. 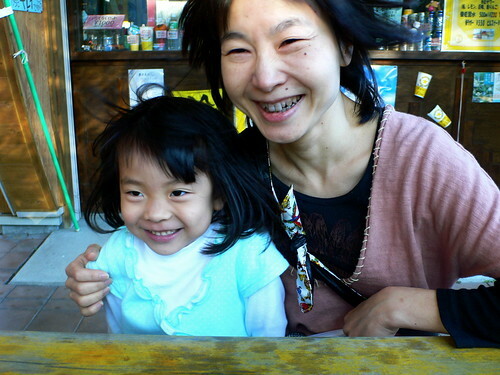 In this way Reversible Destiny mirrors the Tactile Dome‘s mission of reorganizing our systems of “perceptual prejudice,” but at the level of landscape rather than the level of interior space. 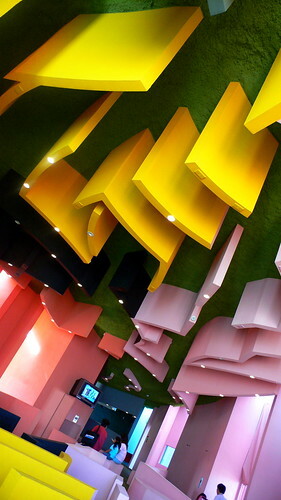 This is the interior of the Reversible Destiny Office, a brightly colored building that houses a model of the park, a video about the park, and most importantly, a ping-pong table that’s mounted on the ceiling of the men’s bathroom. This was one of my favorite spaces to wander around in — it was like being drunk inside a box of Play-Doh. With its sloped and undulating floors, ceiling designs that copy floor in inverse form, and walls of varying heights that also function as furniture, this unconventional building subverts the norms of interaction between architectural structures and the human body. This is the exterior entrance to the Critical Resemblance House, a maze-like structure that literally tears apart domestic space so that you re-encounter it as eminently enjoyable junk. I’ve always loved exploring junk — ever since I was a kid and went dumpster-diving with my dad — because junk misplaces the consumables of capitalist culture in such a way that they become strange and wonderful again. Inside the Critical Resemblance House, walls cut through sinks and refrigerators, mattresses float off the ground, and toilets stand agape at impossible angles. The interior of this house is anti-navigable and you have to climb over household appliances and squeeze through cracks in the walls in order to move through it. This is the top of the wall that surrounds the bowl of the Elliptical Field. Unfortunately, because of the angle of the sun, it was impossible for me to get a photograph of the Elliptical Field as a whole, but from inside of this high wall you overlook the whole of the park. 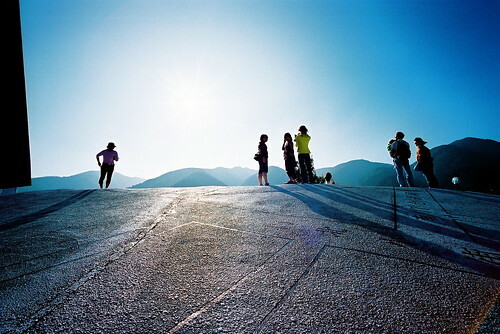 In order to get to the lookout area, however, you have to walk through what amounts to a thin trench. In fact, the trench-path is so thin that when other visitors come through you have to force yourself against the wall so they can get by. This demands a kind of alien contact with strangers and a renegotiation of normative social boundaries. Generally this leads to smiles and giggles as groups of people squirm past each other. 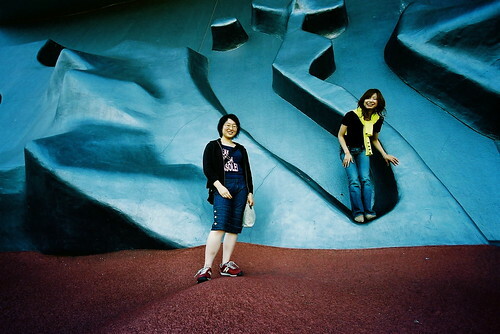 Here’s Harada-san and Keiko-san posing at the Kinesthetic Pass, which is kind of like a giant silver climbing wall. Of course, there were people climbing all over it and posing for pictures. There’s also a seating area of off-kilter sofas that would make any contractor with a proper level flinch for miles. Click here for the official Site of Reversible Destiny site, which has great photos and an animated, 360 degree panorama view.